Photograph depicts Alec Jackson (right) and an unidentified woman presenting Stan Korsch (middle) with an award for his service as Past President of B'nai B'rith Lion's Gate Lodge No. 1716, held at Congregation Beth Israel. Photograph depicts Joyce Lowe and two unidentified women [order unclear] with a certificate. 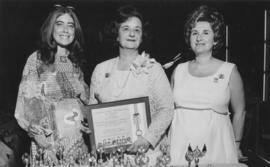 Photograph depicts Anita Waterman and Joyce Lowe in front of awards table full of small trophies. Photograph depicts a group of unidentified women on stage receiving awards and clapping. 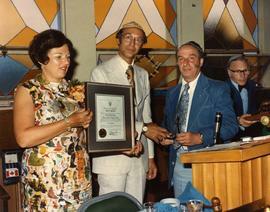 Photograph depicts Alec Jackson presenting an award to an unidentified member at a B'nai B'rith event. Photograph depicts a certificate that thanks Chevra Kadisha for its donation to the Child Maintenance Fund in honour of Abraham Wosk.Written on the verso: "Chevra Kadisha honors Abraham Wosk." Photograph depicts Nathan Nemetz standing with three men seated on either side of him. Photograph depicts Alec Jackson (left) presenting an award on behalf of the Canadian Zionist Federation to Rabbi Wilfred Solomon (right) for his service as Chairman of the Canada Israel Committee.